Grass Bubble Bar | £3.75 // This has quickly become one of my favourite bubble bars from Lush. I love the sandalwood scent mixed with neroli and bergamot. It also works really well with other scents and is one that I use quite a lot in bath cocktails. I also really like the simple design and it reminds me a bit of the pop in the bath bubble bar. Big Bang Bubble Bar | £3.75 // This is another one that I really like the design of. It was a Oxford Street exclusive but is now available online and I think in pretty much all Lush stores. The pink stars are also a bath melt so when used together it creates an incredibly moisturising bath with a lot of bubbles. I love the simple tangerine and grapefruit scent and is a lovely summer scent. This wouldn't put me off using it in the winter though! Far from it, this is one of the most moisturising products I've tried from Lush and I can see myself buying it again and again. Guardians Of The Forest Bath Bomb | £3.95 // When I first smelt this, I wasn't a fan and thought about passing it onto my mum to try. I ordered it online without smelling it first which was a bit of a risk. It was part of a bath cocktail I wanted to try though so I went for it and I actually loved it. 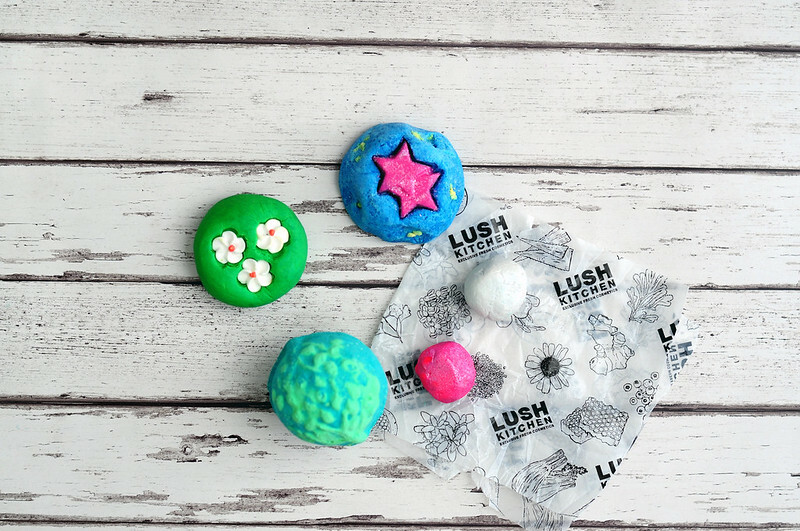 Once in the water, the scent completely changes and works especially well with the Grass Bubble Bar. This is another moisturising one and is made up of lime oil, rosewood oil and cypress oil. This one is packed full of different shades of lustre and creates a real show in the water. Razzle Dazzle Bath Oil | £2 // Although this looks small, you only need to use half at a time and makes the cheap price even better. It has a very similar scent to The Comforter but also has a hint of violet to it. Snow Melt Bath Oil | £2 // Although technically this bath oil is part of the Christmas range, I thought I'd include it here as it wasn't released along with all the other Christmas products. I don't know why, maybe it wasn't ready in time but it's now available. To be honest, I don't really like the smell of this one but I should. It's peppermint and lemon scented but there's just something about it that I don't like.